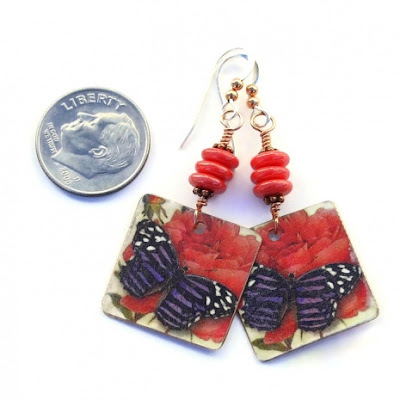 The "Butterfly Waltz" handmade earrings feature faux tin copper butterfly and red rose charms and living coral Czech glass discs. The exquisite BUTTERFLY WALTZ handmade earrings look like a step back in time with their vintage inspired beauty. The one of a kind earrings feature artisan made butterfly and red rose copper charms complemented perfectly by Czech glass discs in the trendy Pantone color “living coral.” The unique charms look like they were cut from old cookie or tea tins. But they only mimic vintage tins since they were hand cut, filed and sanded from modern copper. A permanent metal transfer was then applied: a lovely black, purple and white butterfly looking like it’s going to waltz across a coral red rose looking for nectar. Because the charms were individually handmade, they are very similar, but, if you look closely, you can see a bit of a difference. The back of the charms are glowing copper which will gradually gain a patina over time. Since the charms are made from copper, the earrings are very lightweight to wear. The "Butterfly Waltz" handmade earrings shown hanging - such vintage inspired beauties! The "Butterfly Waltz" handmade earrings shown with a dime for size comparison. 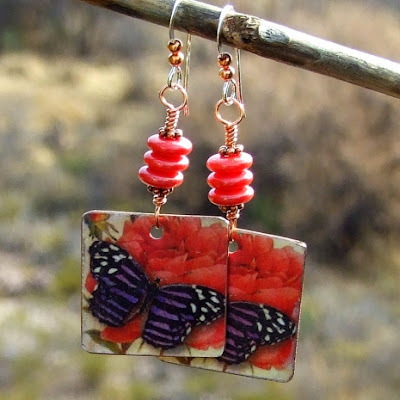 Awesomely pretty handmade red butterfly earrings! These red rose and butterfly dangle earrings are fabulous! 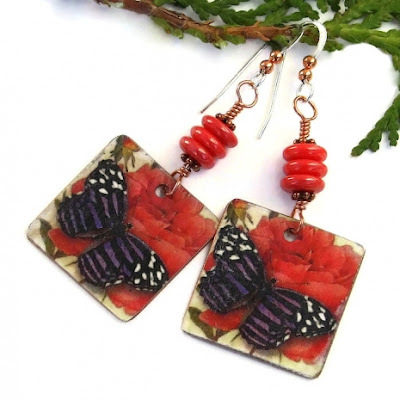 Love those beautiful purple butterflies against the rich red roses in these handmade earrings. Thanks so much, Mary, Sharon and Kathy! Gorgeous butterfly and rose earrings. Thanks so much, Julie and Cathy! These butterfly and rose earrings are gorgeous!